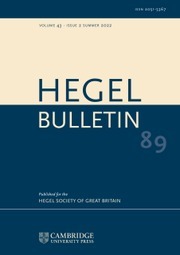 Hegel Bulletin is a leading English language journal for anyone interested in Hegel’s thought, its context, legacy and contemporary relevance. The aim of the Bulletin is to promote high quality contributions in the field of Hegel studies. This field is broadly construed to include all aspects of Hegel’s thought, and its relation and relevance to the history of philosophy; Hegelian contributions to all aspects of current philosophical enquiry, including the modern European and analytic philosophical traditions; German Idealism, British Idealism, Marx and Marxism, Critical Theory, American Pragmatism; studies in the reception history of Hegel and German Idealism.